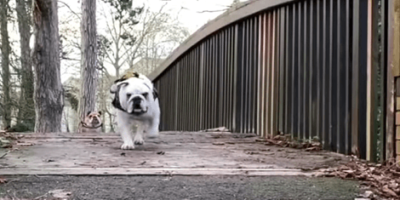 This Adorable Pup’s Workout Routine Will Leave You With An Idea! Just how are we supposed to keep our pups constantly entertained? The best kinds of toys involve our pups running and chasing something all over the place, but often getting a play session with toys like that require us to go running and chasing alongside our pups. And on days when you just aren’t feeling well or can’t keep up, what do you do? Well, this Mom has discovered what the solution is for her English Bulldog pup, Lincoln – a Jolly Egg! It is a large, purple egg-shaped ball that is made out of rigid plastic. And as it turns out, Lincoln absolutely adores it and goes wild over it! This pup is batting it and chasing it all around the garden, and is likely fascinated with it due to its strange shape! Especially since that odd egg shape allows it to move in all sorts of unexpected ways – save for when Mom decides to kick the ball and send it flying, that is! What Happens When Your Pups See A Delicious Piece Of Wood Waiting To Be Tasted? !